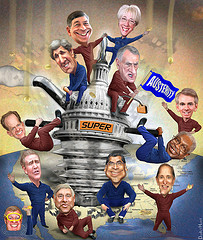 Super Committee Fails. What's Next? By now, most anyone who has been paying attention, even peripherally, is probably aware that the so-called “super committee” put together by politicians to reach a compromise about spending cuts has failed miserably. Limping off into the sunset with nary a whine as the deadline passed, the members essentially took a pass and said, “We can't agree on anything.” This monumental act of indecision means that now we get across the board spending cuts, something many Republicans wanted in the first place. The question becomes when and where will these cuts be implemented? First, a little background. It all kicked off because of a little Federal law called the “debt limit.” Somewhere along the way, someone came up with the idea that it probably wasn't a great idea to give the president carte blanche power to borrow as much money as he liked. After all, Americans might accidentally vote an imbecile into power one day. Thus it came to be that a debt ceiling was put into place. This prevents the president from borrowing more than a certain amount unless it is approved by congressional vote. For years, congress routinely approved debt limit increases without much fuss, but this time around Republicans decided it was time to draw a line in the sand and try to put a stop to what they viewed as a policy that would eventually lead to national economic ruin. They blocked a request by Obama to raise the debt limit, meaning the government would eventually not have enough money coming in to pay current expenses. The end result was an agreement to raise the debt ceiling, but only in return for spending decreases. A super committee consisting of members from both sides of the aisle was appointed. They had from August 2, 2011, (when the deal was agreed upon) until Thanksgiving Day to come up with a compromised way to cut $900 billion in spending from discretionary programs. If they failed to do so, automatic across the board cuts equaling $1.2 trillion would kick in. That's where we are now. Thanks to the super committee failure we're waiting for the automatic cuts to start. But contrary to what the average citizen who listens to the news with one ear while cramming down a double cheeseburger on his lunch break thinks, it's not that simple. se you haven't noticed, there's a little event called a presidential election in the interim. The political landscape could change tremendously. It's not beyond the realm of possibility that a new president and congress could vote the whole deal out of existence, or, on the other hand, make it even more austere than it already is. Things like this happen in a republic where no decision is ever set in stone, but only waits to be modified or overturned by the next round of elected clowns. The basic math is that both domestic programs and defense will have about $55 billion taken away annually over the next ten years. On the domestic side, Medicare, Medicaid, Social Security, Food Stamps, etc, have been declared exempt in the agreement. Politicians of all stripes live their lives in a panic that a move against these American “institutions” is a death wish when re-election comes around. When it comes to defense, hawks would have you believe that removing this amount of money from the military will result in our borders being immediately overran by every banana republic with a rusty machine gun, while bombs rain down upon our heads from above. The bottom line is that no one should count cuts as “automatic” until they are a done deal. Nothing is ever automatic in American politics and, contrary to conventional wisdom, the epic super committee fail doesn't set us down the road to certain fiscal responsibility as much as one might think. We're pretty sure what Americans want to do is stuff themselves silly on turkey, buy a bunch of Christmas presents on credit, watch football on Sundays, and pretend like we don't have a herd of deaf, dumb, and blind idiots marching us towards economic ruin.